6 tablets in blister. Outer package - carton. Provides significant antibacterial effect on most of agents of fish bacterial infections. Pre-dosed pharmaceutical form provides convenient use in small ornamental aquariums. 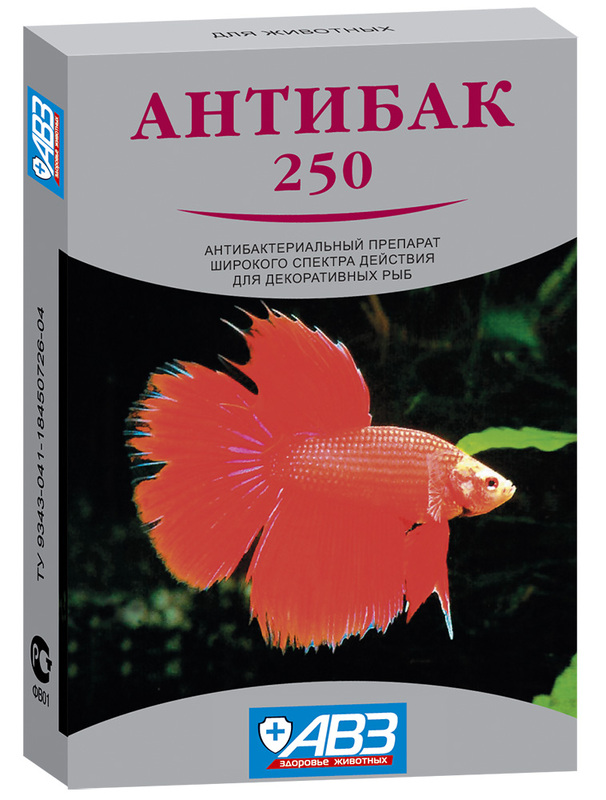 Safe for fish and other aquatic organisms in aquarium. 1 tablet contains 0.25 g of ciprofloxacin hydrochloride as an active ingredient and excipients. Ciprofloxacin hydrochloride (a water-soluble fluroquinolone antibiotic) has a harmful effect on almost all bacteria causing fish diseases (including myxobacteria and enterobacteria). After dissolving in water ciprofloxacin rapidly absorbs via branchiae and penetrates in most of organs and tissues. Use to treat and prevent bacterial infections in ornamental fish such as: aeromonosis, pseudomonosis, myxobacteriosis, furunculosis, vibriosis, streptococcosis, bacterial necrosis of branchiae and fins and other infections caused by microorganisms susceptible to ciprofloxacin. Do not use in commercial fish. It is not allowed to use in combination with other antihelmintic and antibacterial drugs, as well as with water conditioners. Treatment: short-term baths for 4 hours every day within 6 days (1 tablet per 10 l of water). Long-term baths: 6 days in succession (1 tablet per 200 l of water). Regardless of the number of sick fish, treat them all that are kept together. Short-term baths: prepare fresh medical solution every day. Long-term baths: every day replace 20% of medical solution with fresh water and add 1/5 of initial drug dose. Do not use strong illumination devices during treatment. Biological filter efficacy may be potentially decreased. Adverse events and complications generally are not observed in case of administration as per package insert. Overdose: potential body blackening and decreased food activity. Store at -10…+30°С. Protect from light and moisture. Shelf life is 2 years from manufacturing date.